Set in the idyllic University Park Campus, Nottingham Lakeside Arts is a great destination to relax and unwind and to experience the best in performing and visual arts. You can also visit the University of Nottingham Museum and the Weston Gallery which exhibits the best from the University's extensive Manuscripts and Special Collections archive. With two great cafes and a beautiful lakeside walk, there's something for everyone. We look forward to welcoming you to Lakeside soon. Tall white numbered monoliths indicate the entrances to the different facilities at Lakeside, and all carry a map of the local area. Wondering where to visit next? Check out the Art Map for a list of all the galleries and their events in Nottingham. Payment can be made by cash, debit or credit card. Nottingham Lakeside Arts is committed to making the arts accessible. We offer many services for customers with access requirements and are always interested in learning how else we can be of assistance. There is designated disabled car parking across all the venues. This can be found in Lakeside’s main car park and in front of the Djanogly Art Gallery. Please note: to improve pedestrian safety within the park, the disabled parking bays near the lake were removed in late November 2017 and there is no longer parking in this area. Please ask at Box Office for further directions towards disabled parking spaces. Lakeside has access level toilets inside all buildings and wheelchair spaces in both the Djanogly Recital Hall and Djanogly Theatre. Please book wheelchair spaces in advance. There is a Sennheiser Infrared enhanced hearing system in the Djanogly Theatre and Performing Arts Studio (where possible headsets should be booked in advance) and an induction loop in the Djanogly Recital Hall, Box Office, Djanogly Art Gallery Desk, Gallery Café and Pavilion Café. Touch tours, audio description and sign language interpretation are also available for some performances. Touch Tours give you the opportunity to familiarise yourself with the set and costumes before the show and sometimes even to meet the performers. Touch tours are free, but places are limited so advanced booking is essential. Please call our Box Office on 0115 846 7777 for more details. Assistance dogs are welcome in all areas of the building, and if you prefer, we will happily look after your dog while you enjoy a performance. The nearest railway station is Nottingham which is 2.5 miles away, very close to Broadmarsh Bus Station. For ticketed events, Tramlink offer Lakeside visitors a £2 ticket. For just £2, you can buy a return tram ticket from one of the ticket machines you can find at tramstops. All you need is your ticket for the Lakeside event, then select the event ticket on the tram ticket machine - and board the tram! If asked by a Revenue Protection Officer, all you need to do is to show them your ticket to the Lakeside event and your tram ticket. It's as simple as that. If the event you're attending at Lakeside is not ticketed, you can also buy an ordinary tram ticket from any of the ticket machines or use your MANGO card. For ticket prices, click here. How to get to Nottingham Lakeside Arts and Where is Your Nearest Tram Stop? Avoid the city centre traffic by using of them 7 FREE Park+Ride sites. Park your car and hop on board. Don't worry, the Park+Ride sites are all monitored by CCTV cameras and are patrolled by NET staff. You can find your nearest Park+Ride site by clicking here. Alternatively, if you want to find out where your closest tram stop, click here. The closest tram stop for Nottingham Lakeside Arts would be the University of Nottingham stop. REMEMBER, TRAMS RUN EVERY 7 MINUTES, SO JUST SHOW UP AND HOP ON BOARD. The local area is well-served by cycle routes with covered parking spaces available outside the Djanogly Gallery, subject to demand. More information on cycling is available from the University and from Nottingham City Council. Please note: Parking at Lakeside during term time is very limited. There are two free car parks next to the DH Lawrence Pavilion. Pay and Display parking is available on campus subject to demand. Parking on campus is FREE in the Evening and at Weekends – the nearest campus car parks are behind the Museum of Archaeology and on Science Road (the first right after the South Entrance). Parking restrictions are enforced by University of Nottingham Security Monday to Friday 9.15am - 4pm when a ticket will be needed. Please allow extra time in your journey in case you have to walk to Lakeside from the main University Pay & Display Car Park if you are visiting at a busy time. For the Djanogly Gallery and Recital Hall please use the spaces on East Drive (in front of those buildings). 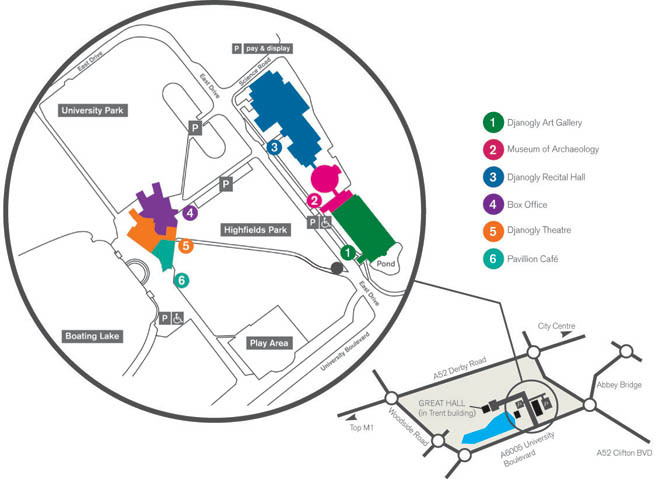 For the Djanogly Theatre or other venues located inside the D H Lawrence Pavilion there are six disabled parking bays in the oval car park next to the Pavilion. Please note: to improve pedestrian safety within the park, the disabled parking bays near the lake were removed in late November 2017 and there is no longer parking in this area.